The Kimberley region is Western Australia’s northern most region, bordered by the Indian Ocean to the West, the Timor Sea to the North and the Northern Territory to the East. Spanning over 400,000 square kilometres it is around three times the size of England and has a sub-tropical monsoonal climate. The three largest towns of the Kimberley are Broome, Derby and Kununurra. Broome International Airport is a major gateway to the region in the West and the Kununurra Airport in the East. The Kimberley is made up of six major townships and over 200 small remote Indigenous communities. Broome is situated in the coastal, semi-arid margin of the canning Basin. Broome is the gateway to the Kimberley, with a vibrant multi-cultural ancestry and a population of around 17,000 people derived from a number of backgrounds. The town of Broome is recognised as a pearling and tourist port town, and a hub servicing the pastoral and resources industries. Derby is 200 north of Broome and has an estimated resident population of 10,000. Derby is on Salt Water Country and is the gateway to the thousand islands of the Dampier Archipelago. 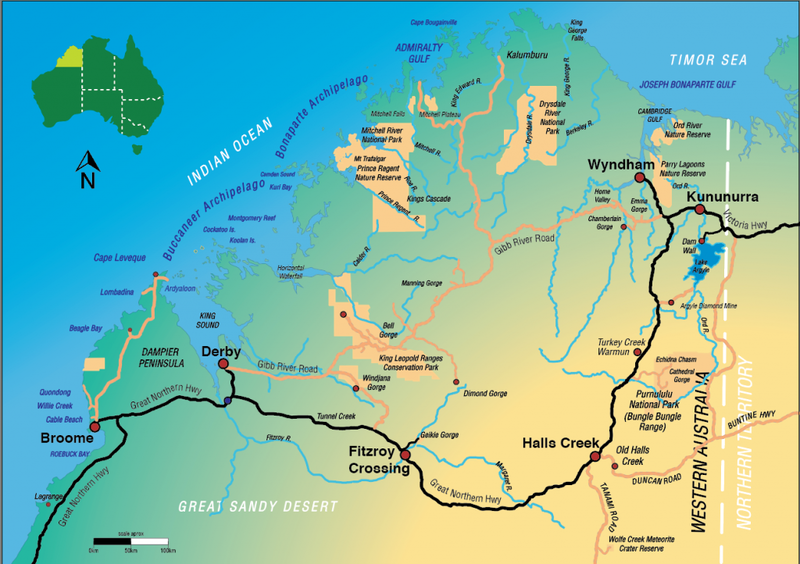 Fitzroy Crossing is located on the banks of the Fitzroy River, approximately 2,500km north of Perth. With a range of fertile soil types the area is used extensively for livestock and horticultural production. Halls Creek comprises desert country and pastoral grazing land with a number of unique natural attractions such as the World heritage Listed Purnululu National Park and Wolf Creek Crater forming the basis of a tourism industry. Kununurra sits just 37 kms west of the Northern Territory border and is a hub for tourism, mining and agriculture including the world heritage listed Purnululu National Park – Bungle Bungle Ranges, the Ord River Irrigation Project, massive Lake Argyle and Argyle Diamond Mine. Wyndham was established in 1886 as a port town which was the principal point of entry during the gold rush. Today its port services the growing pastoral and agriculture industries of the region. Wyndham is located at the point at which five rivers flow into the Cambridge Gulf. Approximately 35,000 people reside in the Kimberley, with over 40% living in the Shire of Broome. Derby and Kununurra are the next largest towns.The population rises up to around 50,000 during the ‘dry season’ when many visitors travel to the region. The culturally rich region has a diverse population with more than 40% being Aboriginal people representing over 30 traditional language groups. The median age of the Kimberley is slightly younger than that of the general Western Australian population at 32 years. Fewer people residing in the Kimberly were born overseas (12%) compared to the rest of Western Australia (36%). The dominant language spoken at home was English, with Australian Indigenous Languages being spoken at home by approximately 14% of the population (reference). Kimberley experiences a sub-tropical climate, characterised by a distinct wet season (November to April) and dry season (May to October). During the wet, monsoonal rains inundate the region, rivers flood, and most of the area is impassable. At this time, the region receives about 90% of its rainfall. The dry season typically has clear blue skies, easterly winds and warm days with occasional cool nights. Average temperatures in the Kimberley are generally above 28 degrees Celsius. The Kimberley has 80% of Western Australia’s total divertible water resources, with less than 1% currently being utilised. Tropical cyclones are a climatic feature in the Kimberley’s coastal regions and can occur throughout the wet season. Mining and resources, tourism, agriculture, aquaculture, construction and retail are major industry sectors in the regional economy of the Kimberley. The region has an abundance of the key natural resources necessary for a strong agriculture and food industry: climate, soil and water. Hosting over 93 pastoral stations raising cattle and a huge swathe of land under crop production as part of the Ord River Irrigation Area, the Kimberley is a major contributor to food production in WA. The Kimberley’s mining resources include Iron Ore, Mineral Sands, LNG and Oil fields and Rare Heavy Earth Elements. The region is a leader in the production of world class diamonds. A thriving fishery industry focuses on high value finfish, prawns and Spanish mackerel, barramundi, threadfin salmon and shark. The aquaculture industry is dominated by extensive pearling and barramundi farms. The unique natural environment provides a strong basis for tourism with coastal cruises, 4WD adventures, authentic Indigenous cultural experiences and regional events attracting over 400,000 domestic and international visitors per year. The ancient Kimberley landscape features a remarkable coastal and inland environment, with unique landforms including the world heritage listed Purnululu National Park – Bungle Bungle Range, ancient cave systems, Windjana Gorge and Wolfe Creek, the world’s second largest crater. The proposed Great Kimberley Marine Park will be the second largest coastal marine park in Australia, made up of the Lalang-garram/Camden Sound Marine Park, Lalang-garram/Horizontal Falls Marine Park, North Lalang-garram Marine Park and the North Kimberley Marine Park. It not only rivals the Great Barrier Reef Marine Park in size, but scientists believe it will be a more significant protector of biodiversity than the Great Barrier Reef. Gantheaume Point and James Price Point feature dinosaur footprints over 130 million years old, preserved in reef rock. Four wetlands in the Kimberley are recognised for their global significance and listed under the Ramsar Convention and support prolific birdlife. The Kimberley is home to many unique birds, mammals, reptiles and sea life. Saltwater crocodiles are found in mangrove systems around the northern coast while freshwater crocodiles and fish including barramundi and catfish are found in the main river systems. The coastline is a major breeding ground for humpback whales and tropical fish. Numerous bird species, marsupials including nocturnals, reptiles, amphibians, insects and other invertebrates are also found in the region. Low eucalypt and boab trees are typical flora in the Kimberley, one of the few regions in the world where boab trees grow naturally. Over 2,000 plant and tree species in the region include livistonia palm and cycads, eucalyptus, Kurrajong trees and numerous species of grass plants. Between July and September each year wildflowers provide a spectacular display. The Kakadu plum is one of the Kimberley’s native edible fruits, said to have the highest Vitamin C content of any fruit. RDA Kimberley plays an active role in supporting our regional community and businesses to apply for State and Federal funding and accessing information on local government funding opportunities. We have developed several resources to help you understand how to best prepare a successful grant application for your organisation or project.